When one thinks of Mario Kart, one thinks of a lot of things. Childhood nostalgia. Evenings huddled around the television with your closest friends. The all-consuming rage that accompanies being nailed by a blue shell and denied victory in the grand championship-deciding race at Bowser’s Castle. The regret you feel as you sheepishly march up to the register at your local Best Buy in order to buy a new controller that has not as of yet been smashed against a hardwood floor. It is entirely unlikely, however, that you think of real-world luxury automobiles. 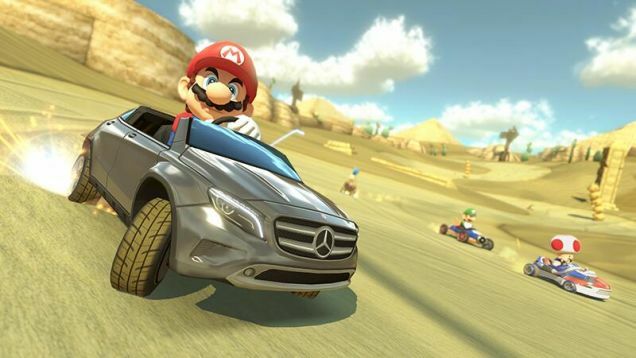 Well, Nintendo would very much like to change that by making the Mercedes-Benz GLA available for download in Mario Kart 8. The Mercedes-Benz GLA in Mario Kart 8 will be available as DLC later this summer, though there is no further information available at this time. We know that it will be made available for Japanese gamers, but will the GLA be downloadable in the west? Does that mean we could also get the E63 AMG? The CLA 45 AMG? Dear god, can we please have a Unimog for Bowser? So many questions left unanswered. In the mean time, you’ll do well to start practicing your power slides and working to strengthen your friendships against the inevitable friction that will arise from a Mario Kart tourney. Stay tuned for more details about the Mercedes-Benz/Mario collaboration as they become available. The social slogan at work here seems to be Go! GLA, as indicated by the cleverly-designed GO-GLA.JP website.